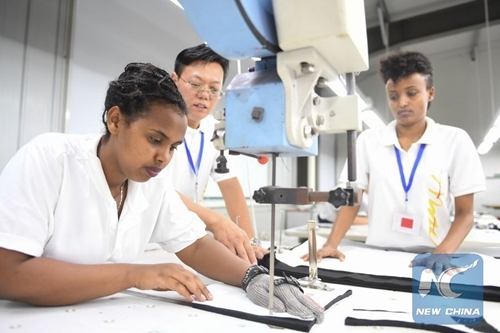 Chinese textile production firm Antex Group has won praise from among Ethiopians as the east African country moves to strengthen its export sector. Antex on Sunday officially started the production of export-oriented textile items inside the premises of the Chinese-built Adama Industrial Park, some 100 km south of the Ethiopian capital, Addis Ababa. The company, which was established with an initial investment of 10 million U.S. dollars, also received widespread acclaim from Ethiopian government officials and local community members for creating about 1,500 jobs. The group's textile products exported from Ethiopia include sportswear, lingerie and casual wear. Antex's plant inside the Adama Industrial Park, the firm's first production line in Africa, is expected to generate an estimated 110,000 dollars from the export of its first batch of products, Group Chairman Qian Anhua told Xinhua on Sunday. "We expect to generate close to 50 million dollars from the export of our products to the international market next year," Qian said. The CEO of Ethiopia Industrial Park Development Corporation (IPDC), Lelise Neme, praised Antex for its success and ambition. "The Antex Group has achieved a milestone despite facing various challenges," Neme said. "We would like to see many international markets-bound containers from the company's production line." Neme told Antex officials that the Ethiopian government in general and IPDC in particular are "ready to help you achieve your targets." Ethiopians who have benefited from job opportunities inside the factory also spoke highly of the firm. Tigist Gemechu, who is now a production line coordinator after receiving robust training for six months, recalled that "it was a proud moment for me and my colleagues to witness the official inauguration of the factory." Gemechu, who commended the "valuable life skills and disciplined work ethics" that she received from the Chinese coworkers, said that the company's future targets are achievable given the "great ambition of the company." "Discipline at work, efficient time management and diligent work ethic are the most important qualities that I learned over the past months," she told Xinhua. The official inauguration of Antex on Sunday came amid strong engagement of Chinese companies in Ethiopia's manufacturing sector, which includes the construction of industrial parks across the east African country. Ethiopia has so far commissioned six Chinese-built textile and garment-orientated industrial parks across the country, which is expected to help Ethiopia achieve its annual export target of 30 billion dollars by the year 2025. The Adama Industrial Park, which hosts the Antex Group, was built by China Civil Engineering Construction Company (CCECC). It was inaugurated by Ethiopian Prime Minister Abiy Ahmed in October this year. Early December, Ethiopia also inaugurated the Jimma Industrial Park, which was built by China Communications Construction Company (CCCC). The Jimma Industrial Park is expected to host investors in light manufacturing sectors, mainly agro-processing, textile and apparel products, according to IPDC. The two industrial parks alone are expected to create employment opportunitoes for more than 40,000 Ethiopian youth, according to figures from IPDC. The construciton of industrial parks is part of the government's drive to transform Ethiopia into a manufacturing hub of Africa and to make it a middle-income economy by the year 2025.